Hi everyone! I've got a couple of Christmas nail posts coming soon but for now let me show you a couple of new nail colors and fabulous glitter toppers that I tried at a beauty store the other day. 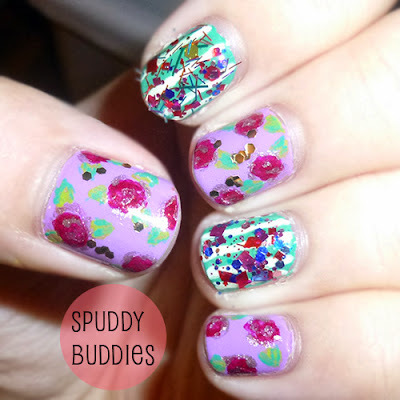 Remember that time I layered glitter over Essie - Play Date and it was all like shazzam confetti in yo faces?! Okay, a tad bit of exaggeration there but who cares, right? Anyway, today I've got a couple of the same glitters but also moreee! 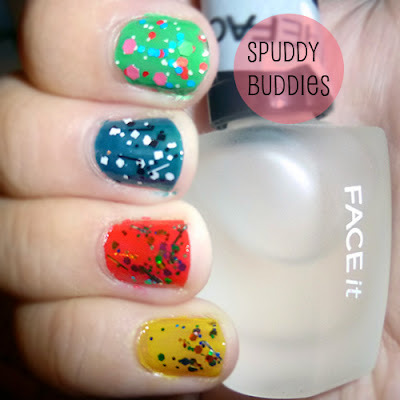 Keep in mind that I tried these at the store so I don't know the names of the polishes I tried. I didn't buy any of these polishes because one, according to everyone I ask, I have enough nail polish and two, I really shouldn't spend any more on nail polish. Sad. Thumb: Sky blue + a combination of circle, bar and micro glitter. Index: Light green + big and small hexagon glitters in pink, red, green, blue and white. Middle: Navy blue + black and white square, bar, circle and hexagonal glitter. Ring: Red orange + multi-colored circle, hexagonal and bar glitter. 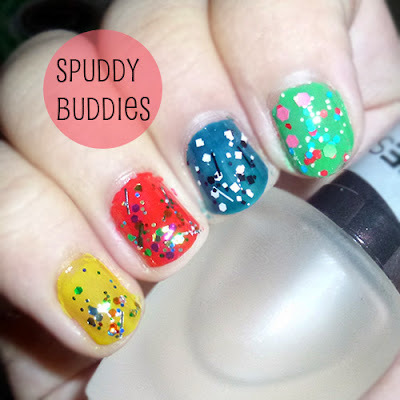 Little: Yellow + multi-colored circle, hexagonal and bar glitter. The color combination of the glitter on my ring and little finger is different so don't mistake them as the same. As you can see, the glitter on my little finger is much more sparse and doesn't spread well. I really love the glitter on my index finger and that shade of green. So unique! On my left hand here, I initially did a floral and stripe nail design which I have yet to post but don't worry, it's coming. I had no intention of layering glitter over the stripes but decided at the last minute that I was going to remove the design on the same day so I would just mess around with the glitter. Yeah, I know, the glitter looks weird layered over the stripe design but let's just ignore that for now and appreciate how dense the glitter layers are. As you can see, the glitter on my index finger has bar glitters while my ring finger doesn't. That's because I layered the bar glitter over the first layer of the glitter you see on my ring finger. What a mess, haha! I also dabbed on gold hexagons randomly onto the my other nails beside the flowers. I'm not sure how I like them but I guess they don't look that bad. What do you think? Which is your favorite glitter? What glitter polish have you used recently? Thanks for reading! And in case I forget to post, happy Thanksgiving!! They look great! I really like the yellow nail, probably because it's not something I'd normally even think about doing! 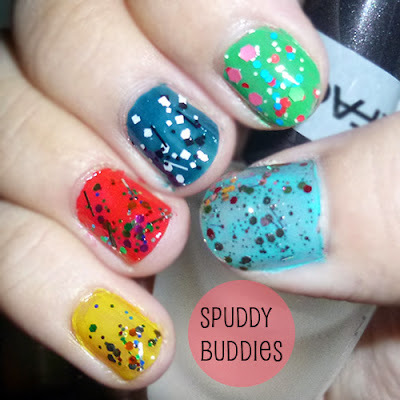 I need some new glitter varnishes as I haven't bought any in ages and got rid of my old ones when they went all weird.